With a 33,000-plus work-force, extensive refining, distribution & marketing infrastructure and advanced R&D facilities, lndianOil play a significant role in fuelling the socio-economic development of the country. With a mandate to ensure India’s energy security and self-sufficiency in refining & marketing of petroleum products, lndianOil has in the past six decades provided energy access to millions of people across the length and breadth of the country through its ever-expanding network of over 47,800 customer touch-points. With a turnover of Rs. 5,06,428 crore and a net profit of Rs. 21,346 crore in 2017-18, and a market capitalization of 1,71,511 crore, lndianOil is recognized as one of India’s most valuable companies. lndianOil operates a network of 13,400 km of cross-country pipelines for transporting crude oil, refined petroleum products, and natural gas, with a cumulative throughput capacity of 94.79 MMTPA of oil and 9.5 MMSCMD of gas. During the year, 543 km of new pipeline sections were commissioned. Keeping all parts of the vast nation well supplied with essential petroleum products is a 24/7 commitment from lndianOil People. During the year, lndianOil continued its dominance in the domestic market with a market share of over 44%, covering the entire range of petroleum products from LPG, petrol, diesel, CNG, aviation fuels, lubricants, naphtha, furnace oil, specialty products, etc. The marketing and distribution network was expanded to over 47,800 customer touch points during the year. (1) Buyback of the fully paid equity shares of the Company of the face value of Rs.10/- each Buyback of equity shares of the Company not exceeding 29,76,51,006 (Twenty Nine Crore Seventy Six lakhs Fifty One thousand and Six only) equity shares being approximately 3.06 % of the total paid up equity share capital of the company at a price of Rs 149/- ( Rupees One Hundred Forty Nine only) per equity share payable in cash for an aggregate consideration not exceeding Rs 4435 Crore (Rupees Four Thousand Four Hundred Thirty Five Crore). (2) Declaration of Interim Dividend on the equity shares of the Company for the financial year 2018-19 The company has declared an Interim Dividend of 67.5% i.e. Rs. 6.75 per equity share of face value of Rs.10/- each. (3) The record date for Buyback as well as for Interim Dividend Pursuant to regulation 42(2) of the listing regulations, it is further notified that the Company has fixed Tuesday, the 25th December 2018 as the record date. IZ Financial Review 1. The Company has shown Revenue growth of 10.61% in the last 3 years. 2. The Company's PAT has grown almost doubles up in the last 3 years, however, due to equity dilution the effect is not visible in EPS. 3. The Company has shown good improvement in both OPM and NPM overs the 3 years. 4. AT CMP of 137, the P/E is 6.27. 1. Firstly, to be eligible for the buyback the investor should have shares of IOC Buyback 2018 in demat or physical form as on the record date [25.12.2018]. 2. Once you have shares in demat, you can participate in the buyback process which is opening from [ 22.01.2019 to 04.02.2019] by selling your shares through your broker on NSE or BSE. 3. Then on [12.02.2019], the payment will be given to you for accepted shares and unaccepted shares will be returned to your demat account. 1. Buyback Announcement date: 13.12.2018—– Share Price was 137. 2. 1342 Shares bought at Rs. 137 means an investment of 1,83,892. 4. The final Accepted Shares were taken back on 12.02.2019. 5. Overall we can say a profit of 16,104 on an investment of 1,83,892 in 2 months. Funds will be credited to Trading A/c or Bank A/c ? 100% acceptance. Got contract note mail from broker. I also received Contract Note from my Broker regarding 100% buyback. Ioc accepted 100%. Intimation received. How do I know acceptance of my shares? How we can check it? Wait for the final Post Buyback Announcement. What will be the Final Accepatance Ratio for IOC. Please reply…. Total shares reserved for Retail were close to 4.35 Cr and till date, total shares tendered in Individual Category( Retail + General) is around 4.12 Cr. So Expect 90-95% AR in IOC. Retail and general both different? Retail plus General is now 5.45 Crores. However, 90% can still be achievable. Hi, where can we get to know this info?? N thanks for the info. coal india to consider buyback of shares on monday . do you recommend to buy? I trade via Idirect. I dont hold any stock as on date of L & T and posing to buy stock tomorrow ( Feb 1st ) . 1. Will I be eligible to participate in buyback offer by L & T? 2. How is record date relevant to buyback process ? First of all L&T buyback is withdrawn due to some regulatory issues. Second query, to be eligible for buyback the investor should hold shares in demat form as on Record date. 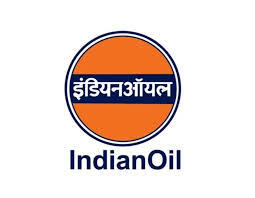 Indian Oil Buyback is still opened till 4 Feb 2019. Please wait for final acceptance ratio. 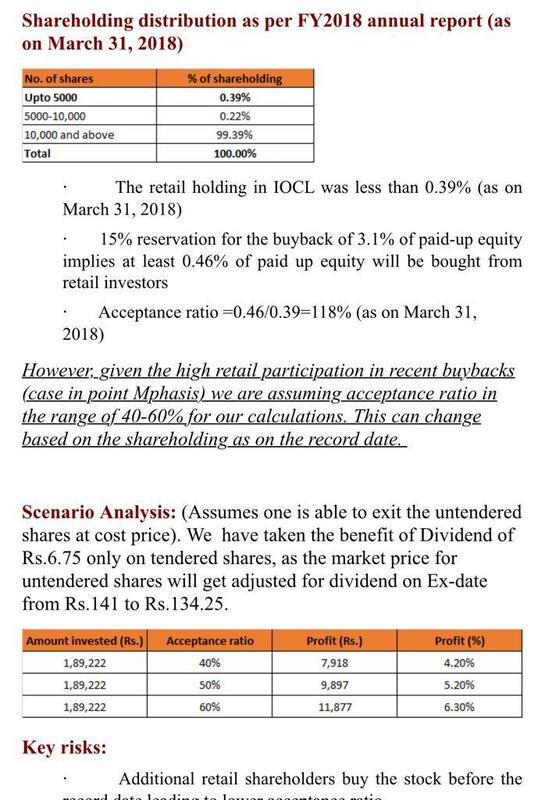 Hos- IOC have high chances of 100% buyback acceptance…. I have purchased 200 share of ioc before record date (18-11-2018). then i have sold it in January 10. Again i have bought 200 shares on January 21. Then i will be eligible for buyback or not? You are eligible sir. Please contact your broker regarding the same. check with given below link..
Only entitlement share are tender?Rest of share Can I sell? Anybody reply.. I think you can provide more than your entitlement in your tender form. They may purchase all that you offer if others have not tendered and they are still able to purchase the additional tendered by others as long as they are able to retain with in the limits of the buyback offer. That’s right. Entitle share are sure shot. May additional, anybody doesn’t know how much will tender. I have received letter for 29 shares out of 80. If I want to tender the 29 shares what should I do? Is there an online option to tender my shares or should I fill in the acceptance form and post it to them? The company will announce a buyback window which remains open for 12 working days. You can tender shares either by filing offline forms or online. Some broker provide platform via trading account to tender shares online. For example in Zerodha one can tender shares online. Thank you for clarifying that Market Wizard. When will the buyback offer be sent to shareholders? is it after an AGM to approve this proposal or has it already been sent and maybe I’ve not received it yet? Shortly we will get the Letter of Offer. There is no requirement of shareholders approval as the size of the buyback was less than 10%. Thank you Market Wizard. Is this a good time to buy IOC? I have few shares prior to record date which I had bought when the oil stocks crashed a couple of months back. I will tender them in buyback but want to increase my holdings by buying additional shares now which are less than buyback price? Will the buyback cause prices to fall further in case it’s better to wait till buyback is completed. Any thoughts on long term potential of IOC. Whether IOC has distributed the dividend of Rs 6.75? I’ve purchased IOC shares on 21st December 2018 and the shares were available in my demat account on the same day. But I haven’t received the dividend yet. Will I receive the dividend or not? You will not get the dividend. The Record date was 25.12.2018. There was two holiday between 21.12.2018 to 25.12.2018. Which other stocks are as good as IOC in terms of paying dividend? Can anyone tell me how dividends are paid by IOC? Are they directly deposited in demet account/bank account or will receive a check? I have 3000 shares (4.15lakh) from IOCL it was perched before announcements of buy back offer. Should I eligible for buy back amount. Will IOC prices will rise anywhere near to 150 until first week of January? IOC may rise to 150. But you would get dividend in first week or Jan or on 31 Dec itself. Buyback should happen in next 2 months. Is it ( T+ 2 days )applicable for buyback of IOC share also ? Anyone tell me the buyback procidure and last date of purchase IOC share for perticipate buyback ? The last date is over now. You can’t participate in the buyback. Can anyone help me understand what is interim dividend and how will I receive in case of IOC? The interim dividend is usually declared during interim financial statements. In case of IOC if you hold shares in your demat account on Record date i.e.25.12.2018 then you will get the dividend. So you should buy shares on or before 20.12.2018 to become eligible because shares are credited in T+2 days. IOC heading towards buyback price. With Crude going down day by day . Ache Din are waiting for Oil Marketing companies. Is it good opportunity to buy IOC at this stage? Not now. It has already moved rs.6 up from the recommended date. Motilal Oswal is accepting close to 40-60% AR in IOC Buyback. Good to see analysts taking cognizance of the fact that buying happening till record date can change the entitlement s and the return expectations. I have 2000 shares of IOC which are of worth more than 2,00,000/- (prescribed for being a small investor), Please tell me if I can tender the shares only worth upto 200000/- and can be counted under small investor category or should I sell the shares before the record date so as to bring down my holding below 2,00,000/- to come under small investor category??? Will IOC fall 6-7% after Rd date and ex div….. Any guess…Mostly these kind of share do…. IOC may fall 5% because it will go ex dividend as well on the record date. But since oil is at low price company may get benefit once subsidy burden is taken off. What will be acceptance ratio. I am staying away from this oil..
General category buyback process ? what is the opinion for investing in yes bank, please tell me. At CMP, the Yes Bank is good investment pick considering it is available at a cheap valuation as compared to its peers. Once the dust settles down, it should give a good return. Disclaimer: I am invested in Yes Bank. what is the good price to buy Yes bank? Buy in SIP mode. The best is to buy around 160-170 levels. However, as things are improving at Yes Bank in relation to corporate governance issues the share price of 160 will come or not is questionable. So I would recommend that if you want to buy 100 shares, then buy 25 @180, 25@175, 25@170 and 25@165. So that Average comes around 172 which I feel is a good price. can I get the benefit of both dividend as well as buyback offer for IOC. please tell me. HOW I DO, PLEASE CLARIFY. Buying at current level recommend? Yes. looks a good opportunity considering dividend. Yes, but on Record Date, if the price goes above 149 then you will not be count under Retail Category, however, you can still tender your shares under General Category. Record date 25th december for Interim dividend . Can I sell share after record date ? Am I eligible for Interim dividend ? If anyone answer please tell . Those who hold shares on record date are eligible for dividend, no necessity to hold after record date. What is the Acceptance Ratio in IOC BUYBACK. EMKAY Global is Accepting close to 87% of Acceptance Ratio. Please read the report below. In my point of view, the Acceptance Ratio of more than 85% is possible only when we consider there no downside in the stock and that is possible when crude remains subdued at the level of $60-$65. However, if crude goes above $70 and election nearby the Govt may push the burden on OIL companies to lure voters and in that case, the AR may not be more than 50%. I think we should buy this share at CMP considering dividend of 6.75, the CMP would be close to 133 and from there an upside of 12%. Will it’s CMP reach to 133 prior to the record date? You may buy ONGC instead of IOC. ONGC also to meet on 20 Dec for Buyback. At Current Market of 137, the P/E is close to 6.27. The Price has already corrected a lot in from Jan 2018 when it was close to 208 levels. The Price tanked to 105 when govt announced the burden of Rs.1 to all Oil companies when Crude was rising and I think that is the bottom of the stock. The downside is quite less from the current levels. As far as overall Market is concerned, not much downside is expected in the Market going forward ( except some minor correction) as all the big events like Election are over, 90 days truce in a tariff war, Crude fell more than 25%, the recent IIP and CPI data shows marked improvement, plus govt will try to woo citizens of India before the election. So start buying from the current levels in the market your favourite shares which you were waiting from the last 6 months and ready for Pre- election and pre-budget rally in the market. The Acceptance Ratio could be close to 25%.